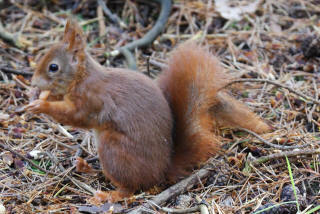 The pine woods here are home to one of the best known homes for Red Squirrels in England. 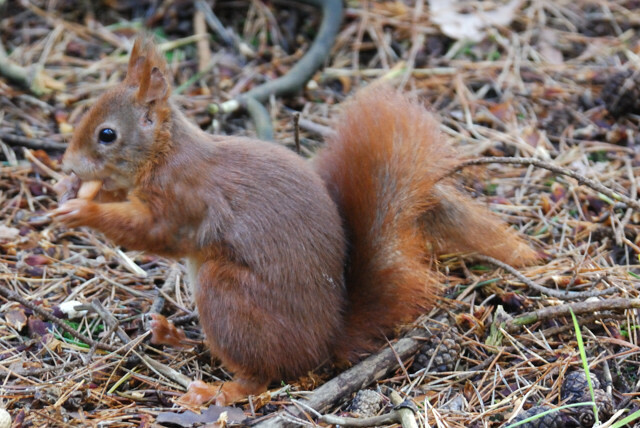 It is owned and managed by the National Trust and they work day and night to protect the 200 Red Squirrels that live in the area. It's on a wonderful stretch of unspoilt coastline set between the sea and Formby town, offering miles of walks through the woods and dunes. 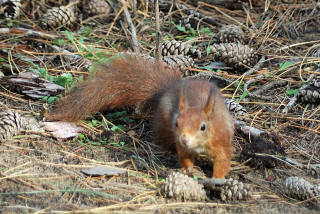 There are interesting plants and birds to be found, as well of course as the cute Red Squirrel. Search for 5,000-year-old red deer footprints on the beach. It is a magical place to visit. 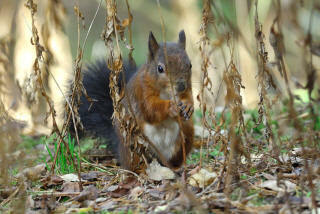 Although the squirrels here are wild and can move about amongst the woodland and surrounding area. Like any animal they know where their bread is buttered and because of the tourists and regular visitors here they are attracted to stay and they just love to be looked at and photographed. 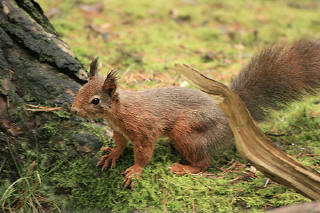 You will see them in the trees, on the ground, amongst the vegetation and even running across the path in front of you. They scurry about and move quite quickly, but when they settle they are a joy to photograph, usually doing some task or other like feeding, burying their food, washing themselves or even chasing each other. You can catch them going up or down trees and they will look at you. 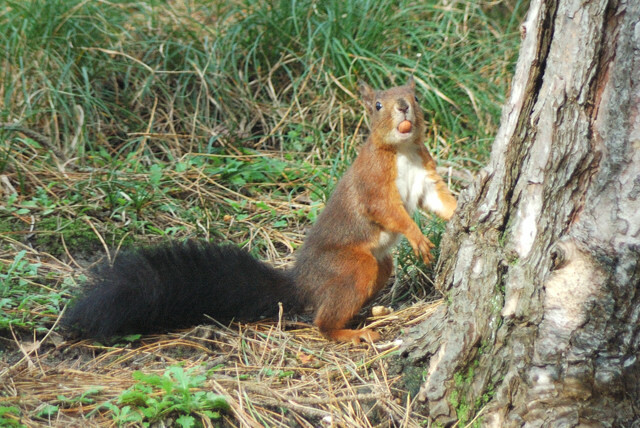 You can put down peanuts in an area you would like them to pose for your shots and at least some will oblige. 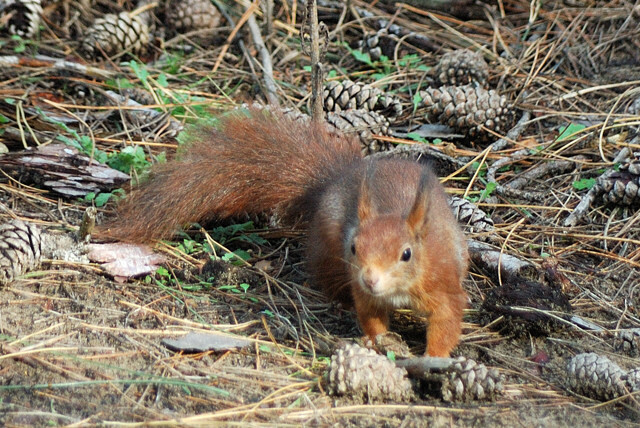 The National Trust run a car park alongside the Squirrel Reserve for access to the beach beyond, and this carries a charge, however entering the pinewoods where the squirrels are is free entry, and therefore if you park in another location and walk to the reserve there is nothing to pay. On entering the pinewoods from the car park you follow a marked pathway, by marked I mean they have a waist high fence running either side of the path which visitors follow and this allows the ground around the trees to remain protected from heavy footfall. The squirrels tend to stay behind these fences most of the time, but they will climb and go over the fence if they want to get to another area. There are other parts in the woodland where you can get closer to the trees and walk amongst the vegetation. You will find that if you leave nuts or something for them to eat, they will retrieve it and come close enough for you to get some great photographs. They are used to tourists. How many you see will depend on the weather conditions, time of day when you visit and how active they are. I have visited three times over the past couple of years and have seen different numbers on each visit, but each time have seen something. There are other places around with the same sort of woodland and vegetation where you may also see them, like this picture which was taken at nearby Freshfield, and the Ainsdale Nature Reserve. 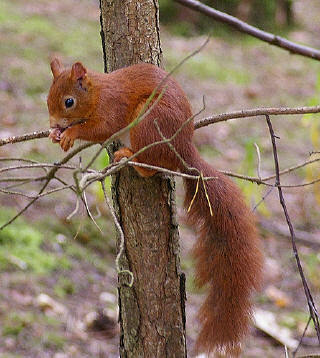 I have also been told that the nearby graveyard in Formby church also has visiting Red Squirrels who are enticed and encouraged by the graveyard visitors having food to hand. Autumn for the squirrels who are in full red colour. From Liverpool, follow signs to Southport until you join the A565. Follow the brown signs from the roundabout at the North end of Formby by-pass. 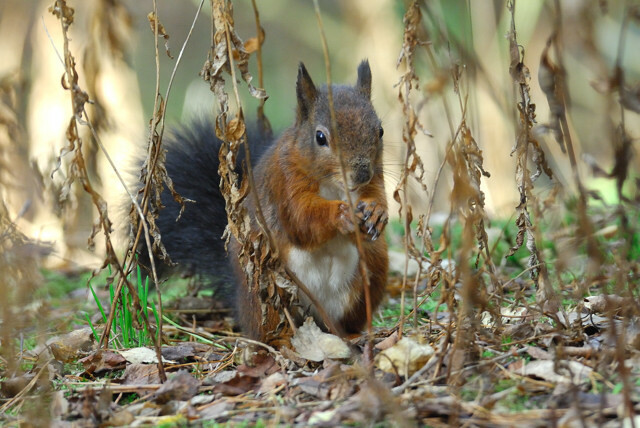 Ample parking facilities and access to the squirrel viewing areas for prams and wheelchairs. Braille guide. Baby changing facilities. Things To Do, See and Photograph: Children's quiz trail. Signposted squirrel walk. What to take: Camera (great close-up photo opportunities), comfortable shoes and windproof jacket. 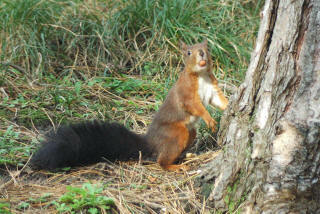 Nature highlights: Red Squirrels. Woodland walks. Bird watching. Toad watching. Open daily during daylight hours. Closed 25th December. Free entry to reserve. However NT run a car park which covers reserve and beach which costs £3.70 per car, free to NT members. Special Needs Access: Grounds partly accessible, undulating terrain. Beach access difficult. Squirrel reserve is sand covered. Children Facilities: Baby changing facilities. Children's quiz/trail. Dogs Allowed: Must be kept on leads around the squirrel walk.